The use of the 3 hues of gold - yellow, pink/rose, & green - is often referred to as Black Hills Gold according to legend. 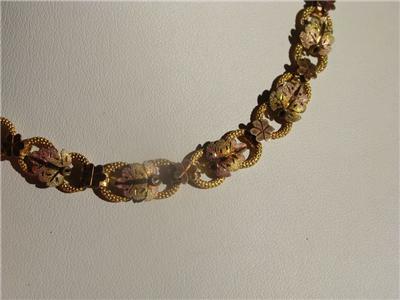 The legend surrounding this type of gold is that, "A young jeweller travelling to the Black Hills to find gold became lost and dreamed of finding a brook with grapevines along side. When he awoke his dream was true. Feeling that the dream saved his life he set up a business where he made jewellery in the grape & leaf designs using the 3 colours of gold in each piece. This was circa 1849. Legend has it . . . Good luck comes to all who wear Black Hills Gold Jewellery. It is such a pleasure to present such a Beautiful, solidly constructed Antique, the chain of which was popular prior and during the time the book chain came along in mid-Victorian times. 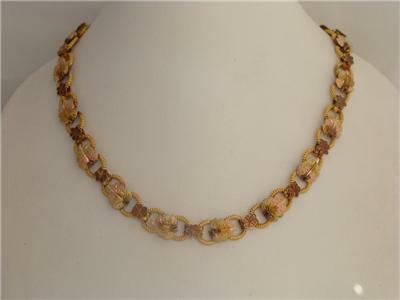 It is comprised of pairs of joined, textured links, with a Yellow Gold hue, atop which sit textured leaves combining rose/pink and green gold hues. and alternating with daisy-shaped. Each leaf appears to have been tooled By Hand with a delicate pattern with a sparkling, star-dust effect. To think this was produced by hand up to 150 years ago is amazing. You certainly do not see this type of craftsmanship today – please view the pictures for the best description. The craftsmanship is of High Quality and with that silky smooth feel usually only associated with solid carat gold. Near MINT Antique condition! The links all retain their original shape & the fluidity and there is no damage, repairs, dents or wear evident. You will be ABSOLUTELY thrilled with this purchase! These wonderful old chains in such great condition are VERY RARE. You will be thrilled – such an eye-catching piece of history.